You may have never heard of Relax Gaming but their a B2B provider who provides casino games to various online casinos and clients – they’ve ventured into the online slots world with their first ever slot, Erik the Red. Formed way back in 2010 and located in Malta, Relax Gaming is best known in the industry for providing casino games, including slots, from suppliers such as Push Gaming and Genesis to online casinos. They’ve decided to take the plunge and create their own online slots – Erik the Red is their first game. With a Norse mythology theme, Erik is Red is not about Eric Cantona – it’s about viking Erik and wife Helga who searches for an idyllic land for his crew. With 5 reels and 20 paylines, you can spin away from just 10p a spin across all devices and in a variety of languages. With the icy waters of the Norwegian sea in the backdrop, Erik the Red looks fantastic – it comes with a Mystery Stack feature where 1 symbol is randomly chosen to appear fully stacked on every spin. There’s also a Free Spins feature where you get 8 free spins initially. Furthermore, scatters illuminate lights on the meter above that reel – if you fill all 4 lights, the reel becomes a sticky wild reel for the remainder of the feature. With more free spins on offer, you could benefit from 5 fully wild reels! This can lead to payouts of 959.2 times your total stake in the feature. 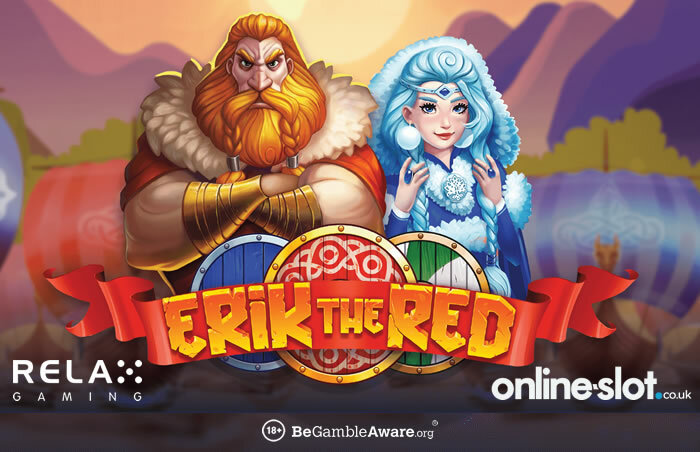 Erik the Red can be found at many online casinos – I recommend you play it at Mr Green Casino who welcome Online-Slot.co.uk readers with an exclusive 20 no deposit bonus spins on NetEnt’s Starburst. Then make your 1st deposit to get a 100% match bonus up to £100 (i.e. deposit £100, get a £100 bonus) as well as 200 more bonus spins.